In Domaine Nerantzi we have a new and exciting organic producer near the border of Macedonia and Thrace in northern Greece. Spontaneous yeast fermentation, locally sourced oak and cooperage, and a hands-off vinification regime point to their locavore philosophy. 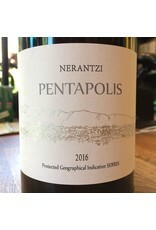 Nerantzi Mitropoulos and his daughter Evanthia specialize in the resuscitation of native varieties lost to the wider world of oenological endeavor. Indeed between the red variety Koniaros, and the white Asprouda of Serron, they have already reintroduced two wholly new genomes to the field. To walk through their 15 hectare domaine is to walk through a piece of the viticultural patrimony of the world.